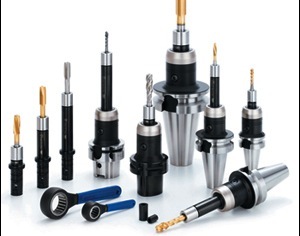 BIG KAISER Precision Tooling Inc., was originally established as the U.S. subsidiary of Heinz Kaiser AG, Rümlang, Switzerland in the spring of 1990. BIG Daishowa Seiki, is one of the world’s leading producers of precision tool holders and measuring accessories, it operates four manufacturing facilities in Japan, one in Osaka and three in Awaji. The company was established in 1967 and now employs more than 500. Heinz Kaiser AG (HKAG) celebrated its 66th anniversary in 2014, and is Europe's leading producer of precision boring tools and modular tool systems. HKAG and its subsidiaries serve manufacturing communities in the global market of more than 30 countries. Diaset - The entry level Diaset line of contact digital tool measuring and presetting stations are perfect for basic presetting and measuring needs. 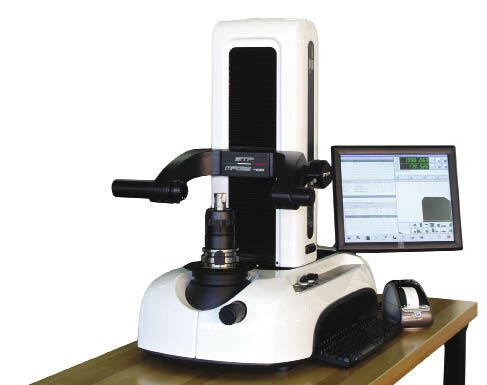 Speroni The more technologically advanced Speroniline line of contact digital tool measuring and presetting systems, with non-contact measurement and presetting capabilities utilizing projectors and vision systems are designed for DNC and CIM applications. Speroni tool room management systems are designed to reduce tool management time by putting the right tool in the right place at the right time. A new line of tool presetting and measuring systems & controls which revolutionizes the way one uses software in the tool measuring world. In today's world, software companies add screens, windows and menus in order to give the user more features. Speroni's MAGIS control for tool presetting and measuring combines all of the needed features and functions in a user friendly, clean and trouble free single screen user interface. The Speroni STP MAGIS tool presetter eliminates the trial and error of tool set-up while providing first part precision - saving you time and money. BIG Kaiser offers the most accurate and flexible BIG CAPTO systems available. Achieve the highest level of precision & flexibility for your multitasking operations. As a licensed manufacturer since 2002, BIG Daishowa through BIG Kaiser offers a wider range of rotating BIG CAPTO Tooling than any other provider. Extended reach collet chucks feature the world class New Baby Collet system with less than 3 microns guaranteed accuracy at 4xD. 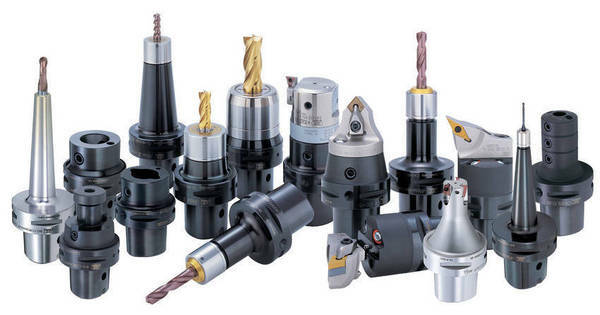 Other premium tool holding solutions with BIG CAPTO include the MEGA ER Grip, Hydraulic chucks, the MEGA E collet system, MEGA D milling chucks for highest rigidity of end milling, MEGA Micro chucks with the world's smallest collet system for reaching into tight areas, and many more. BIG Kaiser offers two key products lines to meet your tapping needs. The Mega Synchro Tapping Holder, available in 41 bodies and 45 tap holders, offers ideal projection lengths for any machine. It improves thread quality and tool life by reducing thrust loads caused by synchronization errors during rigid tapping. The Drill Tapper is a unique system for drilling and tapping. This quick-change holder lets you exchange taps and drills in seconds, providing two operations with one stable head. Get the most out of your current machining center with the simple, powerful addition of BIG Kaiser Angle Heads. By allowing vertical, horizontal and angular operations without repositioning the workpiece, our Angle Heads dramatically increase both accuracy and productivity. Angle Heads leverage your current machine's capabilities - giving you the results of a brand new machine without the expense. 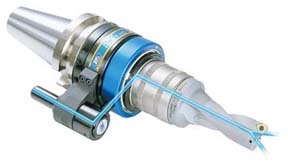 HI-Jet Holders introduce coolant capabilities to machine tools without coolant-through spindles. HI-Jet Holders minimize overheating and distortion of workpieces and allows coolant-through cutting tools to provide faster metal removal rates by flushing chips out of the holes. With reduced heat generation, tool life is greatly extended. The most successful manufacturers in the world invest in superior tooling because it is good for their bottom line. The precision and ruggedness of KAISER boring heads deliver measurable performance advantages - significantly reducing finishing cost and cycle time. 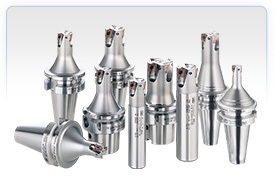 The KAISER modular precision tool system is the solution for drilling, rough boring, finish boring,milling and tapping. Important customers are not only the machine-building, auto, and aircraft industries, but also machine tool manufacturers, tool & mould makers, and job shops that equip their machining centres with KAISER tools in order to offer the customers solutions according to their demands. 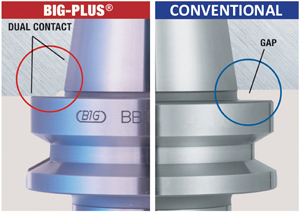 It's a spindle system that provides dual contact between the spindle face and the flange face of BIG-PLUS® tooling. Simply by switching holders, you can greatly increase tool rigidity, reduce runout and add significant productivity to your machining applications. BIG-PLUS® holders and spindles are manufactured to micron level specifications. The unique tool holding technology increases surface contact with the tool holder, maximizing rigidity and clamping pressure. There is a significant advantage in tool life, accuracy and cutting capability when compared to standard tool holders. Because of the unique design, the system allows complete interchangeability between existing tooling and spindle systems. No shim kits or spindle face qualification is necessary. The most successful manufacturers in the world invest in superior tooling because it is good for their bottom line. Greater precision, longer tool life and deceased downtime are just a few of the cost saving benefits of investing in premium tooling. 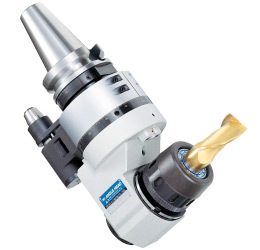 From the powerful Fullcut Mill and the super smooth Speed Finisher to the versatile C-Cutter Mini, our line of high quality milling tools delivers measurable performance advantages that drive down costs and maximize profits - guaranteed. We'll improve your most demanding applications, or we'll take back our products...no charge. 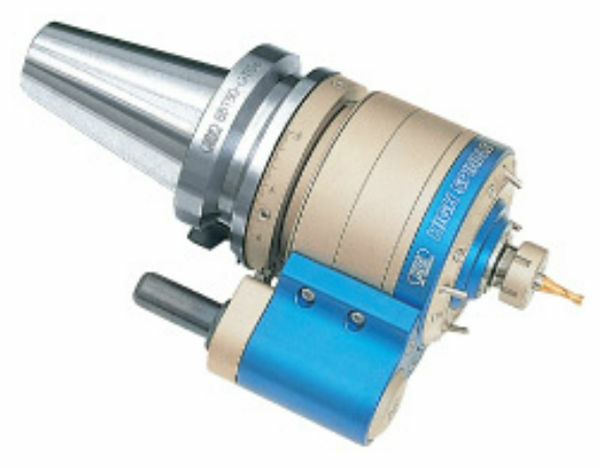 Boost the speed of your existing machining center up to 20,000 - 80,000 RPM with High Power Spindleand Air Power Spindle, spindle speeders from BIG Kaiser. These units can be used on existing machining centers to provide dramatic enhancements to surface finish quality and extended tool life. In addition, continuous use of machine spindles at high revolutions can shorten the life span of your spindle due to excessive load on its motor and bearings. Spindle speeders provide all the performance benefits of a high speed spindle without the increase in load, greatly extending the life and performance of your machine. "To get the greatest productivity and flexibility from the KAISER 112 boring system, we recommend replacing the fixed bar & insert holder with a radial adjustment bar & insert holder which keeps the bar at centerline at all times." "We often get asked to spec out tooling packages for new CNC mills and one of the questions we encounter most, or should, is how do you select the right toolholder collet size for your companies applications? 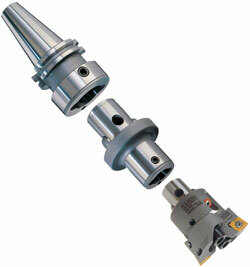 The real choice is in the size of the collet chuck itself. So several considerations should be reviewed…"
When Boring gets painful is it time to go digital? "Boring tools with a digital readout aren’t the standard in U.S. shops, but their use is growing. Think about the number of digital equipment interfaces and interactions an operator has when machining." Thinking about synchronous tapping to reduce CNC cycle time? "One of the most common methods of tapping in use today on CNC machines is “rigid tapping” or “synchronous feed tapping.” A rigid tapping cycle synchronizes the machine spindle rotation and feed to match a specific thread pitch. Since the feed into the hole is synchronized, in theory, a solid holder without any tension-compression can be used." "We often run end mill "tests" to determine which one performs best. Obviously, our goal is to "win' the test and get more business for our manufacturer's. This is article is about one our "tricks" and it's also why represent both cutting tool manufacturers and rotary tool manufacturers. We want to insure that the products work together. "All too often, shops invest hundreds of thousands of dollars in a new machining center to increase production, when they could accomplish the same thing with existing machinery at a fraction of the cost. Many machines cut metal less than 50% of the time during working hours— even less in a flexible manufacturing environment where part runs are generally short." "A worn out toolholder will not provide good accuracy and will quickly wear out your cutting tools. Worn tooling can also cause poor surface finish, and may even damage your spindle." Big Kaiser's NEW C-Cutter Mini Triple Threat! "Now you can greatly multiply cutting efficiencies with the new C-Cutter Mini from Big Kaiser. The compact, multifunctional, ultra high feed chamfer mill. Whether you need to chamfer, back chamfer or even perform light face milling, the C-Cutter Mini has you covered." "The new series features a standard boring range of Ø7.87"-13.39" for ISO40/HSK-A63 tapers, and Ø7.87"-24.41 for ISO50/HSK-A100 and larger tapers."